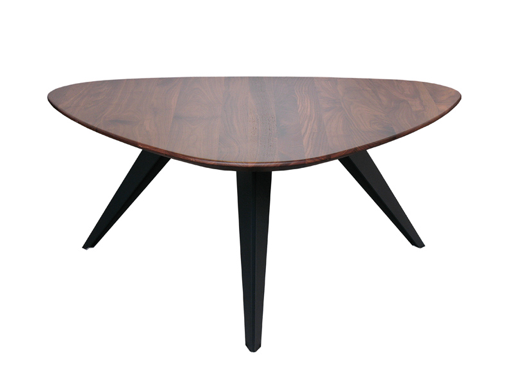 One long and two short legs support an triangle to egg shaped table top. Wooden tabletops and steel legs. Different sizes are available: 90-120 (l) x 90-120 (w) x 45 (h) cm. Special sizes on request. 4-6 weeks in The Netherlands. Europe 5-7 weeks. Outside Europe inquire. Tabletops: available in solid birch MP, solid oak, solid American walnut and in MDF in any RAL colour. The tabletops can be stained in different colours. Specials on request. Legs: steel finished in a matt textured coating, in a grey-black colour, called ‘Carbonne’.